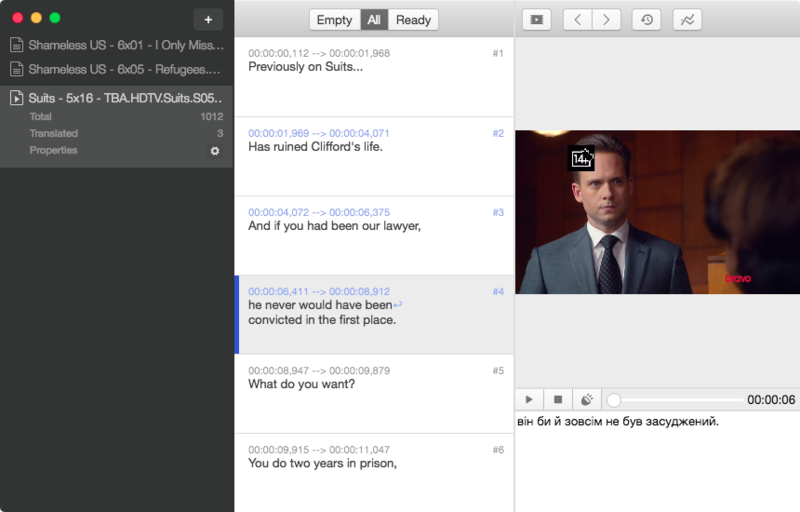 Subordination is a desktop application for translating and editing subtitles. Currently only SRT format is supported. Now install the dependencies for development and runtime. Note that the webchimera.js package may fail to install. It&apos;s a native module and npm will try to compile it from source, but it&apos;s not necessary, because Subordination loads its binary version separately. Just ignore all errors related to it. Also note that Subordination uses a project structure with two package.json files. See more for details. Or you can try to build a full-fledged binary. All the executables are stored inside the installers folder. Currently Subordination is available only on Mac and Windows. The author doesn&apos;t use Linux on desktop and can&apos;t create anything decent for it. But there is no fundamental problem with it. All the components used in Subordinations can be run on Linux as well. If you want to contribute, please let me know, I&apos;d gladly accept your pull requests.